This was taken my first week in India. It is a photo of me meeting this outgoing girl with a great smile, who was selling roses along the streets of Mysore. We were both 8 years old, yet we had lived completely different lives. I have struggled with this inequality ever since. About me...I was born in 1998 and raised in the US, however, for a short period of my life I moved to Bangalore India, where I lived for three and a half years. I lived when I was eight years old until I was twelve, and it was in these years when I learned first hand about the injustice and extreme poverty in many parts of the world. I remember clearly looking into the eyes of children my own age, who were begging on the streets for a living, and wondering why I had the fortunate life I had and they had theirs. When in India, I also travelled to many other countries such as Cambodia, Vietnam, South Africa, Egypt, Thailand Borneo, Indonesia, and Nepal, where I saw similar issues of exploitation of the poor and vulnerable. The first time I became really interested in the issue of slave labor and especially child slave labor was in 6th grade when a guest speaker gave a speech at my international school in India. He worked with an organization that helped free people from slave labor and shared many detailed stories of those they saved from slavery. This speech became the inspiration for my 500 page novel about slave labor that I would begin in the US in 7th grade. Once I was back in America, I realized the shocking amount of ingorance about the modern day slavery, and most people have no idea that slavery still exists. The truth of the matter is slavery exists all around the world, even in the US. Since, I have been working on my book, which I plan to publish soon, and I have also made a trip back to Bangalore where I gathered more research on the root causes of slave labor in India. This is a photo of me and a girl named Gayatri, who was 15 years old at the time like me. Unfortunately, that is where our similarities end, as she has been trapped working in a silk factory since she was 7 years old. It is hard to understand why some of us have so much while others have so little. 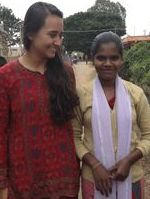 So, while I am free and have resources available to me, my aim is to try and be a voice for kids like Gayatri, who are not free and who have no voice of their own.